Do prosocial persons have more children to increase fitness? A recent article published by Austrian anthropologists Martin Fieder and Susanne Huber in the high profile online journal PLosONE suggests that prosocial persons have more children because this increases ‘fitness’. The study compares the number of children in 2004 by respondents in the Wisconsin Longitudinal Survey (WLS) who report doing volunteer work as a form of prosocial behavior or not. 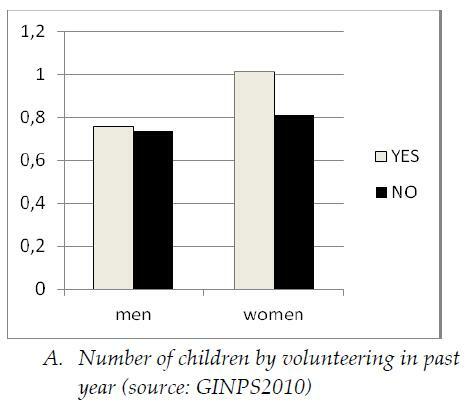 The finding is that male volunteers have a higher number of children than males who do not volunteer, while female volunteers have a lower number of children than females who do not volunteer. In itself this difference does not say anything about the fitness of prosociality. The difference could result from many other factors that were not measured in this study, such as religion. Also the direction of causality is unclear. Volunteering by persons with children is often benefiting the children indirectly, e.g. when parents volunteer at the schools or for sports clubs of their children. In these cases the volunteering is the result of having children rather than the other way around. It could be argued of course that a prosocial attitude is underlying both having children and doing volunteer work. This is in fact the assumption in the article – the authors do not measure prosocial attitudes directly, but use volunteer work as a proxy. If the results from the WLS reflect a biological universal, the regularity should be found in other parts of the world. An analysis of data from the Netherlands however shows exactly the reverse pattern. The Giving in the Netherlands Panel Survey (GINPS) includes measures of the number of children, gender, volunteering, and prosocial attitudes – the construct that was not measured in the WLS. Here are the results. Figure A shows that male respondents who volunteered in the past year had about the same number of children (0.76) as the male respondents who did not volunteer (0.74, difference NS). The female respondents who volunteered, however, had a larger number of children (1.01) than the female respondents who did not volunteer (0.81, p<.008). Figure B shows the number of children among respondents with a high score on the altruistic values scale included in the GINPS. This scale measures the importance of helping others, the willingness to share one’s possessions with others, and the value attached to engaging in charity work. Male respondents with an above average score on the altruistic values scale had fewer children (0.68) than male respondents with a below average score on the altruistic values scale (0.82, p<.049). Among female respondents there was no difference (0.91 vs. 0.88, NS). These results stand in contrast to the findings by Fieder & Huber using the WLS. The differences in the number of children between volunteering and non-volunteering males and females do not reflect a biological universal. 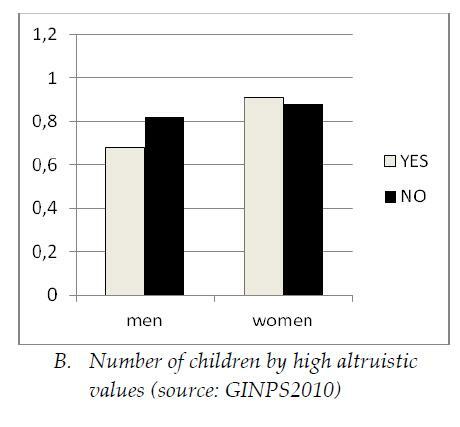 Also the differences in the number of children between respondents with high vs. low altruistic values – a closer measure of prosocial attitudes than volunteering – do not align with the differences between respondents engaging in volunteering and respondents not engaging in volunteering. If anything, one would conclude that males in the Netherlands have more children when they are less prosocial, and that females in the Netherlands who volunteer have more children than females who do not volunteer, but that this is not due to a more prosocial attitude among those women who volunteer. Fieder, M. & Huber, S. (2012). The Association between Pro‐Social Attitude and Reproductive Success Differs between Men and Women. PLoS ONE 7(4): e33489.